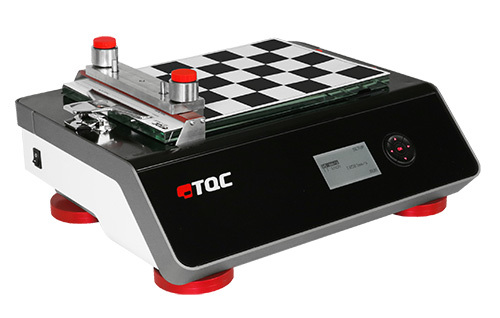 The TQC AFA Compact is an entry level film applicator that accepts charts up to A4 size or 8.3 x 11.7 inch (210 x 297 mm). Application speed can be set from 1 to 150 mm/s. The AFA Compact is suitable for both wire wound rod applicators and block applicators. 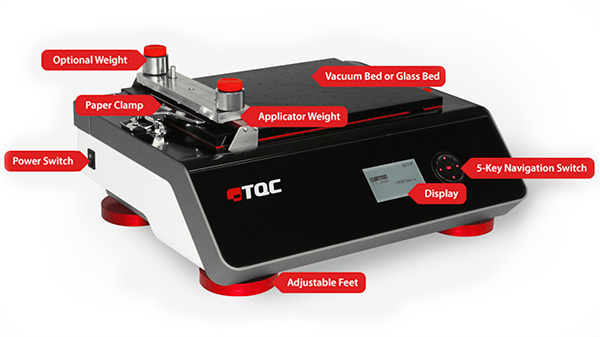 Operating is easy through the standard TQC operating interface. The AFA Compact is available with a glass bed or a perforated vacuum bed. Traverse Speed 1 - 150 mm/s / 0.03 - 5.90 in/s and infinitely adjustable. 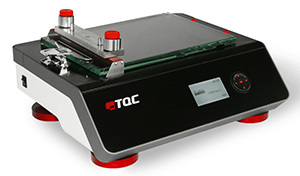 Triple i Control - Operating is very easy with the Triple i operating interface. 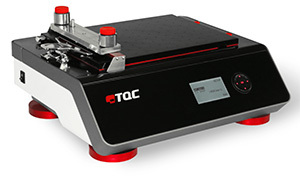 This unique system guides the operator through the interface of TQC lab-machines. At each step of the operating menu the interface detects which buttons are active and indicates these by means of an illuminated red centre. This results in a very intuitive operating system which is enhanced with information on the machine’s display. Supplied with drip pan and paper holder for easy cleaning. This model keeps the test charts in position via means of a glass bed which is produced out of ultra-flat, hardened, float glass. Test coating test charts or other specimen are kept in place via a manual stainless steel clamping mechanism. For cleaning purposes the glass bed can easily be removed without the use of any tools. AB3650 can be used with hiding power charts, opacity charts, spreading rate charts , brushout cards, metal test panels, paper- or cardboard coating test charts, penetration charts ,plastic or wooden sample panels, foils or other flexible surfaces with a max. dimension of Din A4 or 8.3 x 11.7 inches (210 x 297 mm). This model keeps the test charts in position via means of an ultra-flat perforated vacuum bed made of hard-anodized aluminium. A stainless steel clamp is also fitted to fix the draw down charts without vacuum. For cleaning purposes the vacuum plate can easily be removed without the use of any tools. AB3655 can be used with hiding power charts, opacity charts, spreading rate charts, metal test panels, paper- or cardboard coating test charts, brushout cards , penetration charts, plastic or wooden sample panels, foils or other flexible surfaces with a max. dimension of Din A4 or 8.3 x 11.7 inches (210 x 297 mm).